Naughty Papa and Mamarazzi left me again while at Ah Mah's place. They went to A & W without me. Sneaked out while I was sleeping. 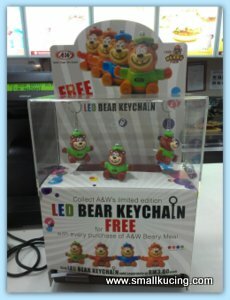 During that time, A & W was having these cute bear keychain promotion for each Beary Meal purchased. After having so much of others burger, Mamarazzi felt good having A & W Mozza Burger. See how nicely they wrapped the burger. Just need to pull out the top. An it's ready to be eaten. No messy hands. Mamarazzi said it's nice to have something different. Anyway, Mamarazzi got me the Beary Toy Keychain. It's a keychain and also double up as a torchlight. Aiyor...they are so bad!!! Come, come...uncle take you to my restaurant - A & W mah!!!! LOL!!! 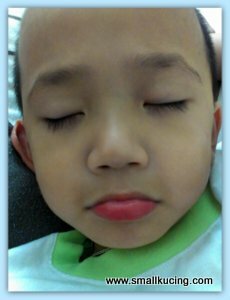 there are always other times..don't worry..
mamarazzi so noty lah hahaha... lil boy kena make up some more with red lipstick so cute!!!! 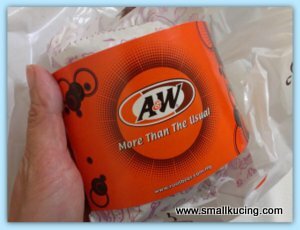 I remember when I was a teenager, Ipoh had their first A&W before McD and KFC was born... going to A&W was a privilege those days! Love their beer and coney dogs! aiyoh, how can that be??? ditched small kucing for "two people world" at A&W??!! that day mamarazzi went BookXcess and didn't get any books for small kucing..
oh, A&W!! 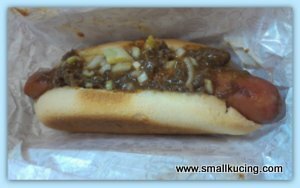 i normally just order their coney dog or fried chicken only, it's like very default and no need to think one, haha!! aiyoh, got the cute cute bear bear keychain with LED torchlight?? interesting.. I have never even heard of A&W so i do not even know what i am missing! I love A & W! Do they still do their root beer floats? I like to send u a postcard..pls email me yr home address. what long eyelashes your boy has. jealoussss.